A comfortable working environment wouldn’t be possible if not for air conditioners. However, while it gives us a more conducive area to work in, it also needs to undergo routine servicing or worse, get repaired. 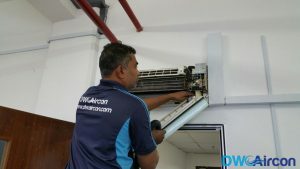 Whether you’re moving into a new office or in need of a commercial aircon repair, it is important to engage with a reliable aircon specialist to get the best commercial air conditioning services available in Singapore. 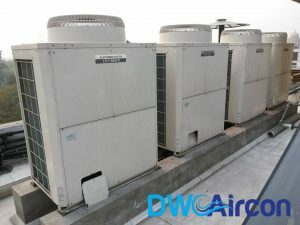 At DW Aircon Servicing Singapore, we offer quality commercial and industrial aircon services with reasonable pricing. With our top-notch commercial and industrial aircon services, you’ll be assured to receive quality aircon work for your office. 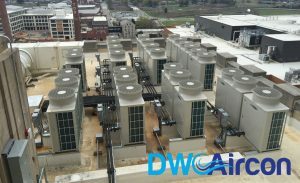 Looking to install new commercial air conditioners at your office? 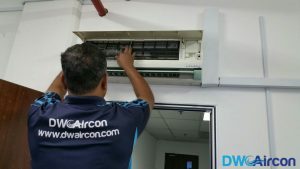 DW Aircon Servicing Singapore offers a range of aircon installation packages including VRV and VRF systems. 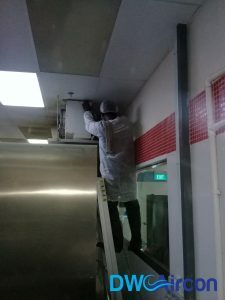 Our professional aircon specialists are highly equipped with the necessary skills to install all kinds of commercial and industrial air conditioners in Singapore. Whether it’s a cassette aircon, fan coil units, or VRV and VRF systems, we’ve got you covered! 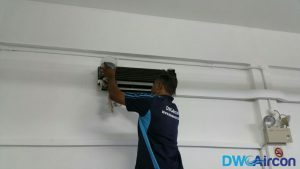 With our reliable and experienced technicians, you can only expect the best aircon installation service in Singapore, delivering quality work with great detail and efficiency. 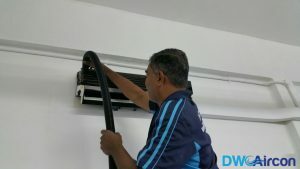 Our routine commercial aircon maintenance service will ensure that your office air conditioners are in tip-top condition. 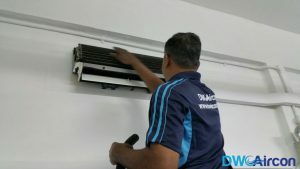 Making sure that commercial and industrial air conditioners are routinely serviced is important in order to detect if there are any malfunctions or problems that need to be addressed. By detecting any possible issues, you’ll be able to avoid more expensive aircon repair costs. We also offer an aircon servicing contract, providing your office air conditioners with regular maintenance and inspection. 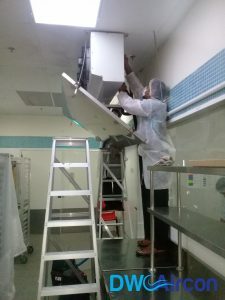 Chemical Treatment: Chemical washing is necessary from time to time, and with our service, your office air conditioners are guaranteed to be free of dirt that may lead to dust borne infections. 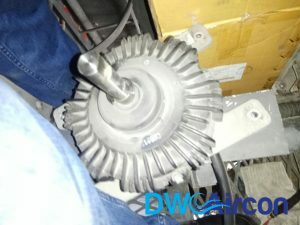 Overhaul Treatment: An overhaul treatment can also be done for a more thorough cleaning. 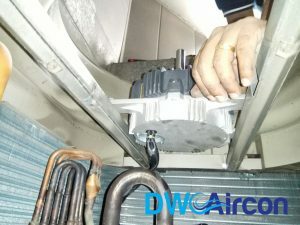 This is conducted by disassembling the entire air conditioner, cleaning every component, and reassembling it back again. Is your office aircon not blowing out cold air or are there signs of water leakages? You might want to get your aircon repaired. Our technicians are highly trained to solve any aircon repair services using accurate troubleshooting. Faulty air-cooling systems in commercial areas will not only make employees uncomfortable, which may eventually lead to a decrease in productivity. 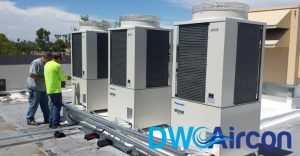 Engage with a trusted commercial air conditioning repair company like DW Aircon Servicing Singapore to quickly get your aircon fixed! 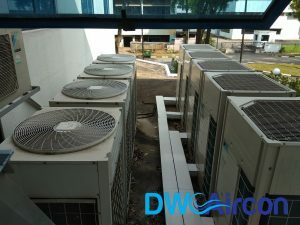 At DW Aircon Servicing Singapore, we offer quality services at competitive commercial and industrial aircon prices. As commercial air conditioners have different features and functions, remember to pay careful attention to the brand and model that you choose. Do some research on the pros and cons of different commercial aircon brands and models in order to find the most suitable one for your office. A split air conditioner would be the best option if you have a small office that does not require that much cooling power. Most people choose a split type commercial aircon as it can be used in separate rooms in your office. You’ve probably seen this type of aircon in places like server rooms, retail shops, and cafes. Additionally, a split aircon consumes less energy unlike other kinds of air conditioners, so you can expect to save a good amount of money on your electricity bill. Aircon installation charges for this kind of unit is also comparatively cheaper. 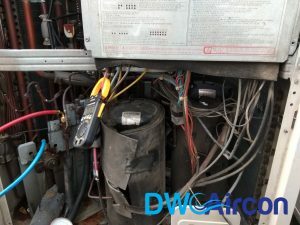 Lastly, since split air conditioners are installed individually, your entire cooling system will not shut down completely when one unit malfunctions. A multi-split air conditioning system has an operation that is quite similar to split type air conditioners. The only difference is that you can connect up to nine indoor units with a multi-split system. 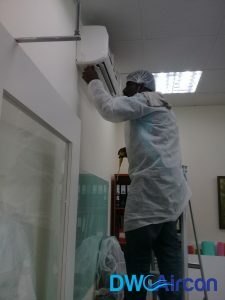 This will save you both space and money as you can install different commercial aircon units in your offices like wall-mounted and ceiling-mounted ones. You can also position these units in different areas of your office that the specific unit is deemed fit. For larger commercial premises like hotels, retail shops, bigger offices and mixed-use buildings, a VRF AC system or Daikin’s VRV system would be a better choice. 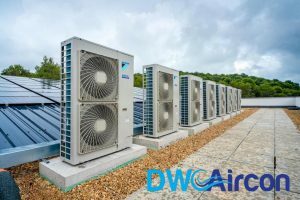 To differentiate, Variable Refrigerant Volume or otherwise known as the VRV system was first introduced in the market by Daikin as explained in our previous article. Such systems are more efficient and easier to control, which makes it one of the most popular commercial aircon system out there. Another space-saving option is the cassette commercial aircon system as they are typically installed in the ceiling. As it blows cold air directly from the ceiling, this air will be evenly spread out throughout the room, hence ensuring comfort for the people inside. 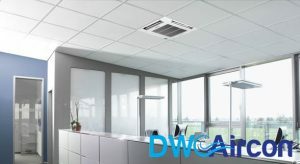 A ceiling cassette commercial aircon will be enough for a small office with at least ten to fifteen employees. Aside from being energy-efficient, no ducting is required for this type of air conditioner. In bigger office buildings such as those found in the central business district, centralized ducted commercial aircon systems are used. While this is a more expensive option, this is considered the most suitable type for larger premises. This is because you can get a perfect balance of temperature and humidity all throughout the area. 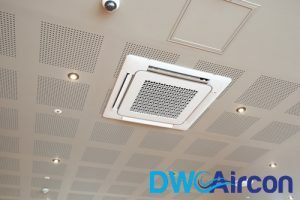 Centralized ducted commercial aircon systems also release purified and filtered air that is free from microparticles such as dust, allergens, and bacteria. With this environmentally friendly system, you can ensure healthy air circulation in your office. Make sure that creating a conducive environment for your employees is one of your top priorities. Choose an office aircon that has a variety of features that can be controlled based on a wide range of preferences. Ensure that the environment is not too hot or cold as this can adversely impact the atmosphere for your employees. As such, you can opt for a central air conditioning system if you have a large commercial area. This system is more preferable for hospitals and laboratories compared to VRV air conditioning systems. If you’re looking for a normal office aircon unit, you can opt for a VRV air conditioning system where you can control multiple indoor units individually without compromising the temperature in other rooms. Keep in mind that you should get a unit that can produce the best air quality for your employees. Several commercial AC systems have air purifying features that can remove impurities such as toxins and bacteria from the air. This prevents any spread of germs that can lead to infections and other illnesses. Ensure that your office aircon filter can trap microscopic particles in the air like allergens, germs, and bacteria. Having a cool atmosphere with less humidity can also prevent the growth of such allergens. Most technological appliances and devices function better in a cooler atmosphere. Having a reliable office aircon that produces a comfortable temperature ensures that these devices are working properly as they would rarely overheat. This will undoubtedly save you money from repair costs. 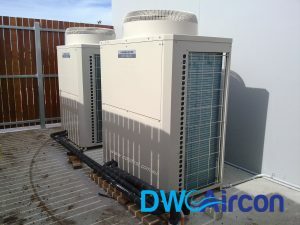 To start off, VRV and VRF air conditioning systems are technically the same. However, Daikin has copyrighted the term VRV, while other aircon brands use VRF to refer to their own HVAC systems. 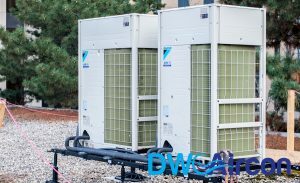 Daikin’s VRV (Variable Refrigerant Volume) systems first emerged in the 1980s, pioneering one of the first HVAC systems. As most brands refer to it as VRF (Variable Refrigerant Flow), the term caught on and became more popularly known compared to VRV. In this kind of air conditioning system, the refrigerant is the only coolant material. As such, it is the only one responsible for cooling the water being circulated throughout the entire system. Allows modular expansion involving huge projects that grow in small stages. The same refrigerant circuit will have several air handling units connected to it. You’ll be able to save more as its inverter compressors make it less energy-consuming. 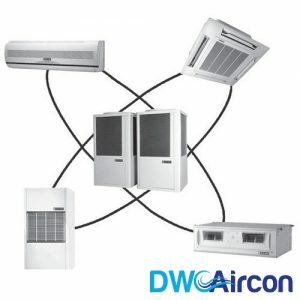 The logic behind the operation of VRV and VRF systems largely depends on the manufacturer and is usually not disclosed. However, in such systems, the input will be influenced by the outside temperature of the surroundings as well as controlled by the user depending on his/her desired temperature. The system then receives the data, after which its logic is implemented in order to provide the most suitable temperature for the area while ensuring optimal power consumption. The VRV and VRF system’s ability to change the temperature according to its surroundings is considered one of its main reasons why its hailed for its efficiency. Initially, the system will be in standstill condition, which means that everything is turned off. Once the user turns on one of the indoor units, the VRV or VRF system then starts working. The VRV or VRF air conditioning system will then examine the outside temperature and that of the room. Accordingly, the compressor will start operating to match the indoor requirements. The process then automatically repeats itself when another indoor unit is switched on. As additional indoor units are used, the power consumption regulates itself accordingly depending on the demand. Users can then achieve their desired comfort conditions by adjusting the fan speed, temperature, operating state, and of course, operating mode. Unlike centralized VAV (variable air volume) systems, the temperatures in VRV and VRF air cooling systems can be modified in each individual room. The VRF system can surely be considered the most popular system among commercial air conditioner brands. It has the ability to adjust its own temperature according to the current atmosphere. Do note that a VRF Aircon comes in different features depending on the brand and where it’s used. You can find the VRF system in renowned air conditioner brands like Mitsubishi, Panasonic, Samsung, and Fujitsu, just to name a few. This type of VRF system allows both heating and cooling, but not simultaneously. This system will work as an evaporator when the indoor unit is in cooling mode. On the other hand, it works as a condenser when it is in heating mode. 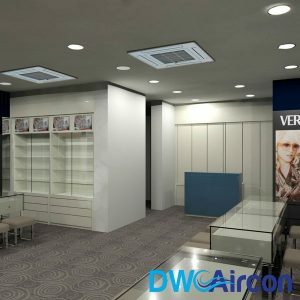 You can see this kind of VRF system being mainly used in cellular offices, open plan spaces, and retail stores where both heating and cooling are required. In this type of VRF system, both heating and cooling can be operated at the same time. In this case, heat will be used rather than rejected. Three pipes are used in this system coming from a solenoid box that contains plenty of valves. There will be two separate units in which one will work as an evaporator and the other one as a condenser. This kind of system is also used in open spaces like the retail shops, or serve as an office AC where there is a constant change in temperature. 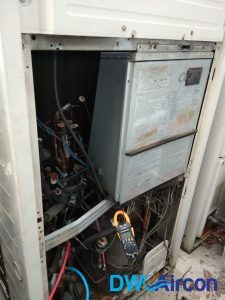 This VRF system is most commonly used because of their packaged condensing units that connect to several indoor units using a refrigeration pipework. This kind of system operates air-cooled units using a plate heat exchanger for heat. This plate heat exchanger then works to transfer energy into a water loop. 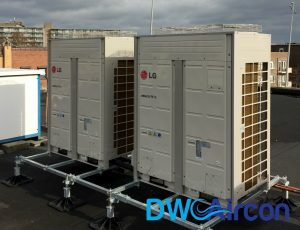 This system will be connected to a dry cooler or a cooling tower, which then transfers the heat or the energy to the atmosphere. With this, this kind of VRF system can be installed even in the smallest spaces. This system is also the perfect option if you need to comply to any sort of environmental requirements. This VRF system is one of the best choices out there when you have limited access to an electric power supply. This VRF system is considered a single phase unit and will be operated by a Calor Gas or a natural gas supply. With one 30 amp single phase supply, it is capable of producing 90kW of heating and cooling. Other benefits of this system also include electrical generation and hot water generation. Most office premises nowadays opt to install a central air conditioning system instead of the usual window or split air conditioner. One major reason behind this is that commercial areas like offices tend to be bigger than residential buildings. Hence, circulation and distribution of cool air around the room are made a top priority for everyone’s comfort. In this case, a central air conditioning system will do a much better job than other air conditioning systems. In a warm country like Singapore, we’re often met with very humid days that hinders our ability to do daily work tasks in a productive manner. But with a central air conditioning unit, the humidity level inside a room is kept in an optimal range, making it neither too warm or too cold for employees. With this feature, people will be less prone to having dry skin. Additionally, the growth of bacteria and germs that are common in places with high humidity can be avoided. The most efficient central air conditioning system should be able to be operated without any trouble. A central air conditioner can usually be controlled by a console, which is eventually programmed for running at a particular time while maintaining a specific temperature whether it is located in one zone or multiple zones. The central air conditioning system can also be operated in a reversed cycle. In this case, it will not only help to cool the air of the interior but in necessity, it will be used as a heat pump which will heat up the room during cooler days. Both these operations can be done with the help of one unit only. Installing a central air conditioning system in an office is also considered beneficial for the health. With fewer bacteria, germs, dust, fumes, and odours released from the unit, you’ll be sure to be protected from common infections. The temperature of the room is also kept constant all throughout, which makes the area more comfortable to work in. Planning to install a VRF or a VRV air conditioning system at your office? It’s necessary that you know about the advantages and disadvantages of the two. 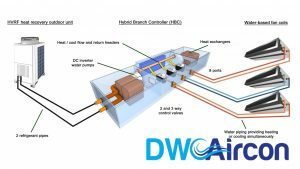 Make sure that you are aware that the term VRV and VRF are technically the same as mentioned in one of our blog posts. With this system, the user can individually control all the indoor units, unlike that of a central air conditioning system. The outdoor unit also has different modules to operate at the required capacity. Meanwhile, you can operate the compressor at various speed levels. The rate in which the VRF or VRV air conditioning system works will largely depend on the cooling requirement as influenced by the outside atmosphere. This is why this unit is considered to be extremely energy efficient. The VRV and VRF AC system have a lot more benefits aside from the ones mentioned above. The VRF and VRV Daikin air conditioning system is deemed the most technologically advanced unit available in the market. It is also extremely energy efficient compared to other air conditioning units. You can connect several indoor units to one outdoor unit. This will undoubtedly save you space as well as make any kind of aircon repairs more affordable as there are fewer units to attend to. Refrigerants used in a VRF or VRV air conditioning system are considered to be more ozone friendly. 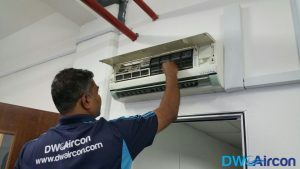 Unlike a split AC system, a VRF or VRV air conditioning system also has lesser electrical wirings, making it easier and less troublesome to install. You will get better air quality because of its air purification features. To attach the outdoor unit, longer pipes are used. So, more often than not, the outdoor units will be far away from the indoor units. This is why the noise generated by the condenser and fans in the aircon units will not be noticeable indoors. At the same time, noise generated from a VRF system is comparatively less than the split AC outdoor unit. As a user, getting a VRV air conditioning system installed will undoubtedly experience greater energy efficiency, get a modular and flexible design, enjoy a simple installation process, and zoned comfort. However, take note that this system also has its disadvantages. 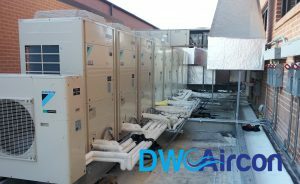 The VRF or VRV Daikin air conditioning system is not considered a good application for units requiring high outside temperature. This system is not suitable to be installed in places such as hospitals and laboratories. 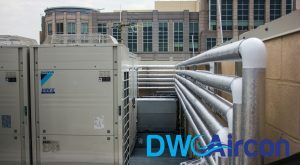 For VRF AC systems, several pipes and joints are required to be installed to successfully put up the outdoor unit and the indoor unit. Only when the installation is done flawlessly do users get to enjoy the VRV air conditioning system for a long period of time. Any mistakes done during the installation can be difficult to find because of its complex installation process. A VRF system cost will definitely be higher than split ACs. Need a trusted and reliable aircon specialist providing top-notch commercial aircon services? 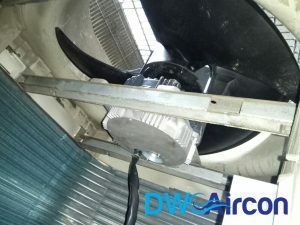 Look no further as DW Aircon Servicing Singapore offers a wide variety of aircon services for all your commercial and industrial aircon needs. From aircon servicing to aircon repair and aircon installation, we deliver quality work like no other! Contact our friendly customer service staff and get honest pricing! Call us now at +65 6653 2988 or email us at enquiry@dwaircon.com. We operate from Mondays to Sundays (9am – 9pm).